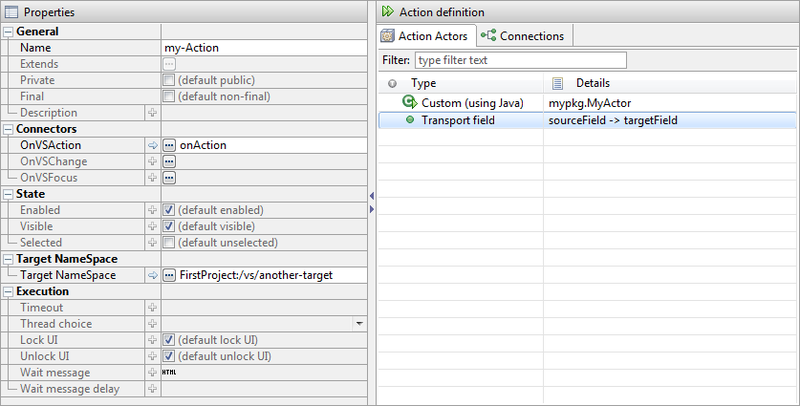 The Action Editor pane is used to define actions and how the Action Actors – these are nodes in the iizi transaction framework (TXP) – are to be ordered and which ones to use or connect to. This definition makes up the TXP process. See section Java class and method connections. Use the more “…” button to drop-down a menu to help you create the method. When you rename the VS Action, it will update you Java source code (name= “newName”), and if you refactor the method name using Java Refactoring, the OnVSAction definition will be set to the new name. The Execution can also be specified to set a Timeout for the TXP process, and in the Thread choice defines in what thread it should execute in. The UI may be locked immediately when the action begins with Lock UI and when it ends using Unlock UI. If the UI is locked, it must be unlocked somehow; otherwise the client will keep on displaying an “hourglass”. This does not have to be when the action ends: it is up to you when and how to do it (the AppSessionGyro contains methods for the UI lock state).